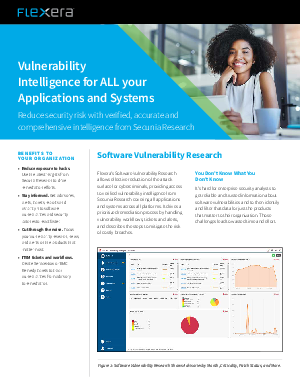 Flexera’s Software Vulnerability Research allows effective reduction of the attack surface for cybercriminals, providing access to verified vulnerability intelligence from Secunia Research covering all applications and systems across all platforms. It drives a prioritized remediation process by handling vulnerability workflows, tickets and alerts, and describes the steps to mitigate the risk of costly breaches. It’s hard for enterprise security analysts to get reliable and trusted information about software vulnerabilities and then identify and filter that data for just the products that matter to their organization. Those challenges lead to wasted time and effort.